ATO developed the “safe harbour” mechanism for calculating car fringe benefits under the operating cost method after consultation and collaboration with business taxpayers and industry representatives. A “safe harbour” is a guideline that allows taxpayers to make use of a simplified and efficient way to calculate their tax obligations where certain conditions are met. Applicable from the 2017 FBT year onwards (from April 1, 2017), ATO has come up with a streamlined approach to working out the business use percentage of car fringe benefits for fleets of 20 cars or more. How does the “safe harbour” approach work? They are an employer with a fleet of 20 or more “tool of trade” cars. The vehicles are not part of salary packaging arrangements, and employees cannot elect to receive cash. The cars have a GST-inclusive value of less than the luxury car tax limit in the year acquired. Employees are mandated to maintain logbooks and there are valid logbooks for at least 75% of the cars in the logbook year. If qualifications above are met, employer can use the logbooks to calculate the fleet’s average business use percentage. The ATO says this simplified record-keeping approach can be applied for a period of five years in respect of the fleet (including replacement and new cars) provided the fleet remains at 20 cars or more. The last condition is subject to there being no material and substantial changes in circumstances. An example of such a change would be a relocation of the employer’s depot that would substantially alter the business use percentage of the fleet. 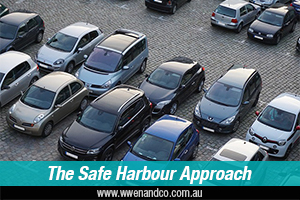 The ATO developed the new safe harbour method after taking on board relevant feedback from tax practitioners and business taxpayers which showed that compliance with record-keeping requirements of the operating cost method can be difficult and time-consuming for employers with larger fleets. See the relevant ATO practical compliance guideline for more details.